I thought in the spirit of starting my blog off with simple food for all, that I’d share one of my all time favorite easy meals. A bowl of this is kept in my fridge at all times for a super quick breakfast, lunch or dinner. I give to you…Chickpea Salad. 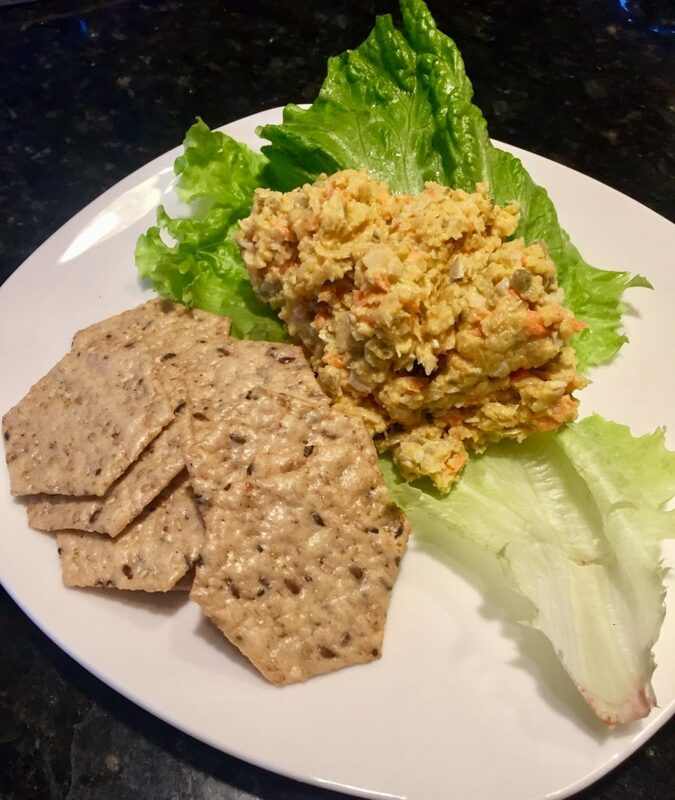 This recipe was inspired by a chickpea salad in one of my favorite cookbooks of all time Isa Does It. But I can’t leave well enough alone, and had to change things up to suit my own desires. Shrug. This salad is packed with protein, fiber and all sorts of other great healthy things to fuel your body. The first question I am always asked when people find out I’m a vegetarian is “how do you get enough protein?” The answer is: I don’t. Just kidding. There are many plants that are packed with protein and this includes legumes and seeds. Just the chickpeas and pumpkin seeds in this recipe provide 9 grams of protein per serving. Depending on what you serve it with you’ll increase the protein content even more…a bed of greens, gluten-free bread or crackers can add up to another 3 grams of protein, rounding this meal out at up to 12 grams of protein/serving! The average person needs between 50-60 grams of protein per day. The protein content of this meal provides up to 24% of a person’s daily protein intake. Cool. I like to eat this dish with crackers on a bed of lettuce, but it is equally delicious on bread or wrapped in a tortilla. The carrots, celery and pumpkin seeds give this a delicious crunch. (And guess what? Pumpkin seeds are packed with omega-3 fats, magensium, zinc and have anti-inflammatory properties. Yup.) The chickpeas give it just enough texture that you won’t even miss the meat. Yum and Enjoy! 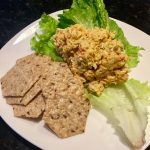 Quick & Easy Chickpea Salad for a healthy lunch or snack. Add the carrot, celery and onion to the bowl of a food processor and process until finely chopped, being careful not to puree it. Scrape the veggies into a bowl. In the now empty food processor bowl, add the pumpkin seeds and chickpeas. Process until finely chopped, but some larger bits of chickpea and pumpkin seed still remain. Scrape chickpea mixture into the bowl with the veggies. Add mayo, vinegar and salt to the bowl and stir well to combine. Enjoy scooping it up with crackers, as a sandwich, or in a wrap! Variation: Add 1-2 teaspoons of curry powder with the mayonnaise for curried chickpea salad. I love this recipe! I have used it as a main course and as an appetizer. You can serve it as a sandwich filling, as a dip with crackers/veggies, in a lettuce wrap or in a pepper boat! It is quickly becoming one of my go to lunches! I want to eat this every week! It’s so tasty, so filling and so healthy!